The peak of the Atlantic Hurricane Season tends to occur in September each year, and this year seems to be no different. August in the Atlantic was fairly quiet. There were only 2 named systems – Debby and Ernesto – both of which stayed out to sea, posing no threat to the Caribbean or US. At the end of the month, however, activity started to pick up. First came the tropical wave off Africa which eventually formed into current Hurricane Florence, more on her in a bit. Second was a tropical disturbance in the Caribbean which eventually became Tropical Storm Gordon. Two additional systems, one already in the Atlantic, and a projected tropical wave off Africa, are also currently being monitored for potential cyclone formation. Gordon officially became a Tropical Storm in the early hours of Labor Day (Sep 3). While no landfall was made in Florida, Gordon still brought rains to southern Florida, making for a soggy holiday weekend. He then moved into the Gulf of Mexico, where it looked like he may strengthen to a weak Category 1 Hurricane before making landfall. While winds never exceeded 75mph, Gordon made landfall near the Mississippi-Alabama border as a strong Tropical Storm, bringing along heavy rains, storm surge, and strong winds. He quickly weakened to a Tropical Depression and as of writing, is situated near the MS, LA, AR border. Gordon is expected to continue inland on a generally northwestward track, bringing rains to Arkansas and Missouri before making a turn for the northeast. A rainy weekend can be expected across much of the Midwest with the potential for flooding in Missouri, Illinois, southern Indiana, and Kentucky. While it’s still far too early to know if Florence will pose a threat to the US East Coast, it will be important to keep an eye on this storm. Florence became the first major hurricane (category 3 or higher) of the 2018 Atlantic Hurricane Season on September 5th following some rapid intensification. After briefly reaching category 4 status, with maximum sustained winds around 130mph, she weakened back to a category 3. Current winds as of Thursday morning are around 115mph. Some additional weakening is possible over the next few days as the system tracks to the west-northwest. 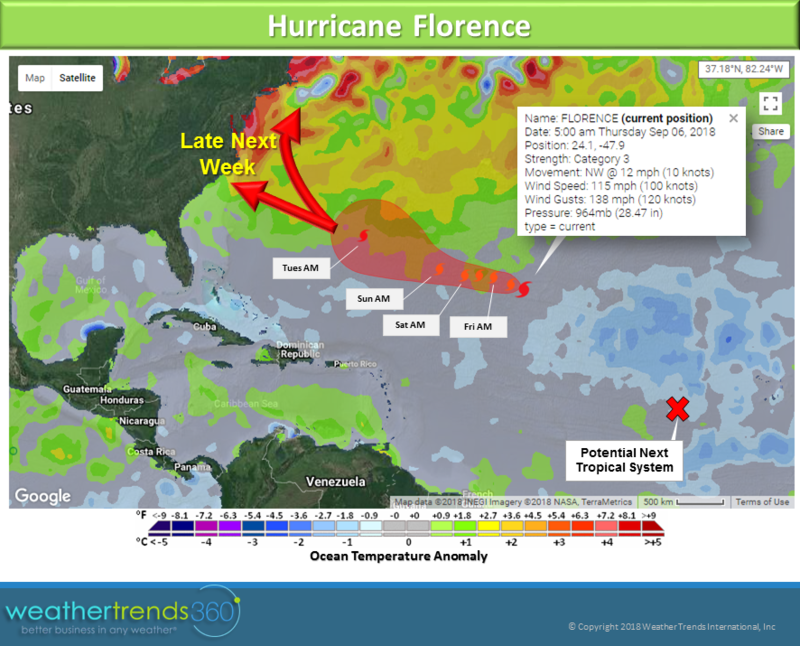 However, as Florence moves closer to the US, she will enter some warmer than normal ocean waters which could assist in re-strengthening. Should Florence impact the US East Coast, it would not be until later next week, but again, it’s too early to pin down an exact track for this storm. As mentioned above, there are also 2 other systems currently being monitored for potential tropical development. The first is located a few hundred miles west-southwest of the Cabo Verde Islands. While the system is still fairly disorganized, conditions are conducive for tropical formation over the next several days. The second is a tropical wave that is expected to move off the west coast of Africa sometime on Friday. Conditions are also conducive for potential tropical development of this system as it moves into the Atlantic.